"Ooo Elinor, I've been invited to join in the Boo Knits October Mystery Knitalong! The secret shawl pattern is called Taboo and it needs 100g lace weight silk yarn. I'm going to dye this skein specially, to get a totally taboo effect." I nudged her elbow and she looked up from doing The Times crossword. "I'm planning a madder root blood colour. Slightly sinister and highly alluring, redolent of transgressive passion with a hint of murder. What colours do you think would be good for the variegated contrast section?" My companion pushed her specs back up her nose. "Red, is it?" She gave me a withering look. "Do bear in mind that hardly any sexual practices are still restricted by today's social customs and murder is illegal. A rather stronger prohibition than a taboo. Hmmm, for your totally taboo effect, we have to consider what really is socially unacceptable these days." Elinor tapped the end of her pencil on the table. "I suggest nicotine yellow with turd brown variations, redolent of the transgressions of the smoker who walks her dog without carrying poo bags." "Oh, that's no good at all, I want this shawl to conjure up the dark forbidden, not pinch-mouthed disapproval. Stop being such a miserable pedant and dream up a major drama for me." "To be honest, Beaut, the only big taboo we've got left is asking people what they earn and nowadays, a monster is a woman who farts in public." She frowned at her crossword. "Tell me when you've decided what colour that would be." Leaving my companion to her cruciverbal efforts, I reverted to less literal interpretations of taboo. Remembering how unevenly dye penetrated the silk hankies I put in my first proper madder root bath, this silk lace was soaked in plain water for two weeks before having 24 hours to cold mordant in a solution of 10g alum and was then kept wet til my dye bath was ready. Changes to my original madder dye method included skipping any attempt to macerate the chopped roots in the blender, since they hadn't seemed to break down much, tying them inside the leg of some nylon tights, to avoid having to pick out a myriad of bits after dyeing and applying very gentle direct heat to the pot for half an hour, hoping to improve dye release, as the underfloor heating in the bathroom wasn't needed in August. Otherwise, I dug up a madder plant from the same patch of the garden, went through the same routine keeping to the same pH, added calcium carbonate as before and waited five days. One of those changes to the method was counterproductive. No blood red, this time. 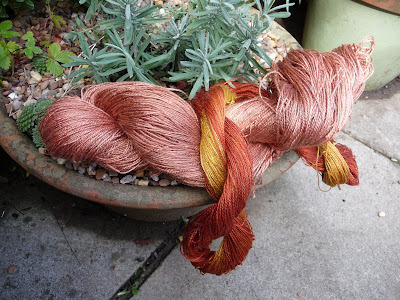 Even after checking the pH, massaging the bag of roots and reheating gently with the silk in the pot, you can see that once rinsed and dried, the final ball of silk yarn is a peachy shadow of the red I got on silk hankies the first time round. "Call it 'Fresh Flesh', with a nod toward cannibalism, Beaut." My companion had come outside to join me checking the dyed silk in natural light. "I see you took my advice about the smoker with no poo bags." 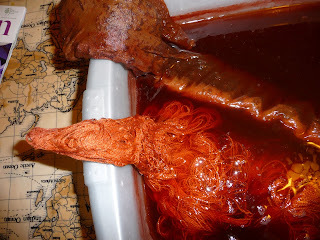 "The variegated bit was dyed with Dyers Chamomile before I put most of the length of the skein into the initial hot water rinse of the madder roots. I thought I would pull a bit more silk out of the rinse water every day and get progressive shades from yellow to scarlet. Looks more like all the dye got taken up on the first day, because I can't see much of a gradient. Anyway, it's not turd brown, it's dark ginger." I sighed gloomily. "I'm not even sure the two skeins are going to look good together. Too late to do anything else now, Clue One of the pattern gets released tomorrow and I'll have to knit like the clappers to keep up with the crowd." The body of the Taboo shawl turned out to have lace patterning, got to concentrate hard from the very start, no mindless garter stitch rows. All those repetitions eventually fixed in my subconscious, alerting me quickly to errors, so I finished the first section on time, without major crises. Clue Two brought in new patterns for the contrast yarn. "Might look alright after all. Not really Concept Taboo, though." "It's all in the name, Beaut. You could call those colours 'Old Blood Seeping from Dead Fatty Tissues'. A Zombie dinner." "You can take your morbid anatomy and stuff it up a pumpkin, Elinor." In Clue Three the beads came into play. I thought gold ones would echo the yellow in the variegation colours, but being clear glass, not opaque, the peachy yarn showed through, dimming their impact. "Gold medals for Fu Yuanhui talking about her periods at the Olympics?" "OK, Elinor, better to break that daft taboo than take up necrophagia." The final Clue included heavily beaded rows and a tight picot bind off, which I did in the variegated colour, as I had plenty left of my 20g skein. Some of the group were demon knitters, way faster than me. It has been fascinating to see how all their choices of colours and beads have worked out. Although far behind the leaders by now, I finished this week and have decided I do like my colours, even if pink and ginger aren't going to get me an ASBO. The Taboo pattern is another beauty, clearly laid out with the written instructions I prefer, as well as charts, leading you safely through the maze of stitches to a glorious finish. I do enjoy the way blocking reveals intricate lace only at the very end of a project. Knitting with laceweight silk was no more difficult than wool, it slips easily and doesn't split, giving a strong, smooth and wonderfully drapey luxury fabric. "Think I might call this shawl 'Hannibal'." "As in Lecter? Or because it took as much effort as getting an elephant over the Alps?" "Buzz off, before I fit you with a mask. Then we'll have some Silence of the Lambs." hm, your companion is a bit snarky, but she's right with her views on taboos:) maybe if you had used lac you'd have had a better chance at a bloodred? the pattern is gorgeous though - might be a good choice for my own blood red stash... I used it for my Uncia, but that could have been done in any other colour! I've not tried lac - is that the one derived from beetles? Might brighten up a dark day this winter. lac is derived from the lac insect, but in contrast to cochenille, where the dried "lice" are ground up to be used as a dye, the lac insect exudes a "resin" to cover eggs and larvae. this resin is harvested and treated to give shellac (which has multiple uses, eg as a varnish) and as a bye product lac for dyeing. quite expensive to buy, but it gives sensational reds (true blacks, too) and dyes deep reds with relatively small dye amounts. (see here:https://en.wikipedia.org/wiki/Lac). That is gorgeous Fran, tell that silly sheep to go and boil herself in your Madder!! !